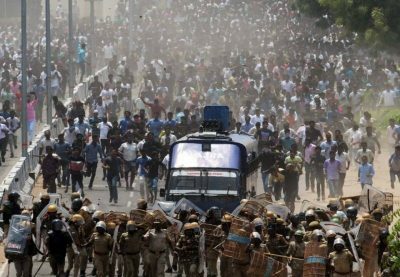 Last month 13 people protesting the expansion of a copper smelter owned by Vedanta Limited were shot and killed by police in the Indian state of Tamil Nadu. In continuous protests that began in February, hundreds of thousands of people have reportedly marched in the streets demanding permanent closure of the plant. Vedanta Limited is part of Vedanta Resources, one of the world’s largest natural resource conglomerates. It’s financed by the Canadian government via Export Development Canada (EDC) despite being blacklisted on human rights and environmental grounds by several investors, including Norway’s government pension fund. The copper smelter in Tamil Nadu, operated by Vedanta Ltd.’s subsidiary Sterlite Copper, has been repeatedly shut down for breaches of environmental regulations. Sterlite was slapped with a $16 million (USD) penalty in 2013 for failing to control pollution and for operating the plant without a permit. This spring, authorities once again withheld approval for the plant to operate, even as Sterlite moved ahead with its plan to turn the smelter into the world’s largest located in an urban area. Vedanta Ltd. faces a long list of grievances over similar misconduct throughout India, including illegal mining, continual breaches of environmental and worker safety rules, and failure to compensate hundreds of displaced families. In Zambia, Vedanta Resources’ subsidiary KCM was found guilty of “gross recklessness” by Zambian courts for decades of severe water pollution. As recently as 2016, the Norwegian pension fund noted Vedanta’s ongoing failure to resolve such problems and opted to keep the company on its investment exclusion list. Yet Export Development Canada (EDC) saw fit to loan Vedanta Ltd. $100-250 million in August 2017. Just days after the deal was signed, a waste pond at one of the company’s aluminum smelters collapsed, damaging about 100 acres of farmland. Clearly reforms are needed to make Canada’s export credit agency legally accountable for the rigour of its screening practices. With Parliament’s upcoming review of the Export Development Act, the government has the opportunity to do just that. It should establish an enforceable legal duty barring EDC from supporting companies associated with high risk of human rights abuse, ecological destruction or other serious harms. See our letter to Export Development Canada about its dealings with Vedanta and the agency’s reply.